with Lefevre Gallery, London, as 'Stow-in-the-Wold', where purchased by the present owner in circa 1979. London, Lefevre Gallery, 1976, no. 10, as 'Stow-in-the-Wold', illustrated. May - July 1976, no. 10, as 'Stow-in-the-Wold'. "Started at fifteen years old. Don't know why?" My aunt said "You are no good for anything else, so you might as well go to Art School." LSLowry began evening classes in fine art and free-hand art drawing during 1905. Later studying in both the Manchester Academy of Fine Art and The Salford Royal Technical College at Peel Park. School records show that Lowry attended art classes during the 1920's. Lowry had learnt from teachers, people such as the Frenchman Adolphe Valette. This French Impressionist artist had made a big impact on the art world. and had great affection for Pre-Raphaelite art, by artists such as Rossetti and Ford Madox Brown. and for a subject matter Lowry could make unique. and Manchester, rather than that of a model posing. Lowry worked as rent collector for the Pall Mall Property Company, prefering to keep the work secret. Lowry did not want people to think of him as a part-time artist. The job led to Lowry walking all over the city providing L.S.Lowry with many sights and experiences. slum clearances and new housing, changed the face of the city Lowry had observed so well. the industrial scene as well as possible. It wasn't easy, well, a camera could have done the scene straight off". erasing and rubbing the pencil lines on the paper to build the atmosphere of the drawing. This artist would often make quick sketches on the spot on whatever paper he had in his pockets. the painting until he started working. He called them "dreamscapes". sky that he desired. Taylor suggested Lowry painted on a pure white background. He experimented with layers of white paint on boards, leaving them for a time until the surface became creamy. I like a medium you can work into over a period of time". brushes (using both ends), with his fingers and with sticks or a nail. when x-rayed showed a female portrait and possibly a self-portrait underneath. Someone once asked,"What do you do with your old suits?" "Wear them", came the reply! Lowry certainly wore them for work, wiping the brushes on his lapels and sleeves. In 1932 the father of Lowry died . For the next seven years, his 73 year old mother became 'bed fast' and completely ruled the life of Lowry. After she died in 1939, Lowry painted "The Bedroom Pendlebury" - in memory of those long hours he spent there. but she understood me and that was enough" Lowry said. bombed-out buildings. In 1939, the year Mrs Lowry died - the person he most wanted to please - success came with the first London exhibition. "When the mother of Lowry died, all interest was lost, continuing to paint was the greatest salvation". Just when this northern artist began to have success, Lowry was moving away from the subjects that everybody wanted him to produce. seascapes. Some of the most difficult pictures to enjoy are of solitary figures and downs and outs. "These people affect me in a way that the industrial scene never did. They are real people, sad people. Sadness attracts me, and there are some very sad things. similar feelings in myself". Everything came too late for Lowry, but the later years saw the British artist become a popular celebrity. "I painted from childhood to childhood". Lowry became an old man - often protesting to interviewers that he had "given up, packed it in". Critical opinion about Lowry remains divided to this day. collection which is now at the heart of the award-winning building bearing the artist's name. Celebrating his art and transforming the cityscape again. A small quantity of paintings by the artist l.s. 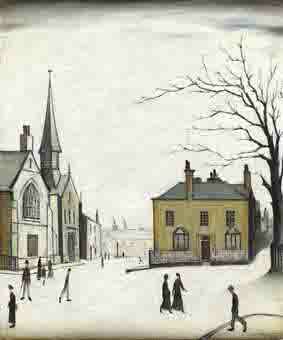 lowry were published as signed limited edition prints. Man lying on a wall, Huddersfield, Deal, ferry boats, three cats Alstow, Berwick-on-Tweed, peel park, The two brothers, View of a town, Street scene.